Capital Markets Today | Listen Free on Castbox. 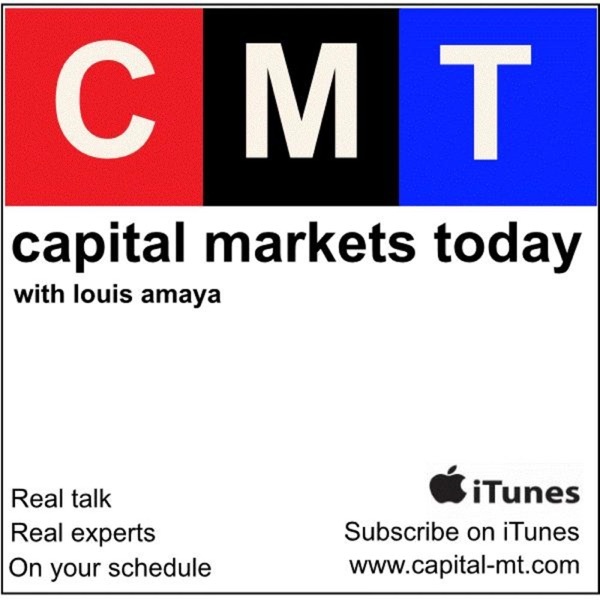 Produced by Capital Markets Today, host Louis Amaya, discusses capital markets, whole loan /MSR/ secondary trading, real estate and mortgage lending with industry experts. NoteExplo - November 2nd-3rd 2018 - Dallas TX Freddie Mac announced this week that it sold via auction 3,247 delinquent non-performing loans from its mortgage investments portfolio. The loans, totaling $569 million and settling in December, are currently serviced by Specialized Loan Servicing LLC. The loans were offered in three separate pools of which the winners were Balbec Capital, Lone Star and MCM Capital Joining the podcast to discuss the non-performing loan market is Bob Repass, Managing Director at Colonial Funding Group. Over the course of his career, Bob has purchased over 40,000 performing and non-performing mortgage loans totaling over $2.5 billion dollars in volume. In addition to managing the firm, Bob is a Managing Partner for Colonial Capital Management, where he is the Chief Investment Officer of CCM’s Colonial Impact Fund II. The DDC Financial's European Investment Summit is being held on May 8th and 9th in Athens, Greece. Listeners can use code NSCM30 for a 30% discount when registering. According to the European Central Bank’s Chief supervisor, Daniele Nouy, Greek banks need to do more to reduce their very high stock of non-performing loans. Nouy indicated that NPLs are the biggest challenge facing the banking sector in the country which is set to exit its third international bailout in August. European Central Bank regulators are attempting to shrink NPLs by 40 percent by the end of 2019. The reductions will be driven by restructurings, collections, write-offs and loan sales. Joining the podcast to discuss Greek NPLs is Dr George Mountis, Managing Partner at Delfi Partners & Company. Delfi Partners specializes in corporate finance, strategy advisory, turnaround & restructuring, real estate asset management & NPL workouts. The DDC Financials' Distressed European Investment Summit is being held in Stockholm Sweden on March 20th and 21st. Listeners of the podcast can use code NSCM30 when registering for a 30% discount Late last year, Angelo Gordon, a $28 billion dollar alternative investment firm focused on credit and real estate investing, announced that it has successfully closed its second European realty fund. The Fund will seek to identify complex and off-market investment opportunities with a focus on U.K. and Western Europe sub-performing distressed debt, office, retail, hotel, industrial and residential assets. Joining the podcast to discuss European real estate investment opportunities is Richard Horton, Managing Director of DDC Capital. Richard has over 30 years of finance, investment, real estate and restructuring experience across Europe and North America. The IMN NPL Mortgage Notes Forum is being held on February 7th and 8th in Fort Lauderdale. Listeners of the podcast can use code SP20 when registering for a 20% discount According to the annual Altisource 2018 default survey published last week, servicers are expecting increased delinquencies in their FHA loan portfolios in 2019. Post-crash, FHA, which some consider as government backed non-prime lending, is at least 50% of new originations. In addition, Experian recently put out a report that indicates defaults across all loan types increased in the last quarter of 2018. Joining the podcast to discuss the note investing business is Paige Panzarello, founder of The Tryllion Group, an NPL investment firm. Paige also teaches the “Building Wealth with Notes” workshops. The workshops train on buying non-performing notes, what to look for in due diligence and how to mitigate risk. The IMN NPL Mortgage Notes Forum is being held on February 7th and 8th in Fort Lauderdale. Listeners of the podcast can use code SP20 when registering for a 20% discount The distressed asset space has been evolving briskly post-crash. There are new buyers and sellers, new servicers and servicing consolidation, new valuation methodologies and access to big data, new impact funds that measure social impact as well as financial returns and new technology that provides transparency and workflow from acquisition to disposition, just to name a few. However, potentially the most transformative change is crowd funding. Several crowd funding platforms have entered the space drastically changing the way operators can raise capital. Joining the podcast to discuss servicing and crowdfunding is DeAnn O’Donovan. DeAnn is President & CEO of AHP Servicing and AHP Capital Management. She is responsible for the oversight and strategy of the companies. DeAnn has over 25 years of experience in real estate, financial services, asset management, mortgage lending, and residential loan servicing. IMN NPL Mortgage Notes Forum is being held on February 7th and 8th in Fort Lauderdale. Listeners of the podcast can use code SP20 when registering for a 20% discount One of the more notable trends in the mortgage servicing business is the continuous growth of non-bank servicers. Non-bank servicers pursue efforts to expand their servicing business through portfolio purchases and consolidation. Just this month, Mr. Cooper announced the acquisition of Seterus Mortgage Servicing adding over 300,000 customers to its platform. Joining the podcast to discuss the NPL servicing business is John Dunnery, Vice President of Government Loan Servicing at Bayview Loan Servicing. Bayview is a nationwide servicer of both residential and commercial mortgage loans. IMN NPL Mortgage Notes Forum, February 7th and 8th in Fort Lauderdale. Listeners of the podcast can use code SP20 when registering for a 20% discount The U.S. housing market will continue to face headwinds that likely will grow in strength according to seven leading housing economists interviewed by Think Realty’s Housing News Report for their annual housing outlook. Home affordability challenges exacerbated by rising mortgage rates will slow home price appreciation in 2019 to the low single digits. In addition, a slowing economy and inflated equity markets could further weaken demand for housing Joining the podcast to discuss the investment landscape in 2019 is Jay Tenebaum, Founder & Vice President at AZP Capital. AZP Capital is a real estate investment firm specializing in acquiring assets nationwide. Jay is also Editor in Chief of the US Real Estate Journal, an online publication covering all facets of real estate for investors. IMN NPL/RPL Notes Forum, February 7th and 8th in Fort Lauderdale. Listeners of the podcast can use code SP20 when registering for a 20% discount According to a recent article in the Wall Street Journal, unconventional loans are on the rise. Credit agency DBRS has predicted a comeback for these loans as lenders try to boost business which has stalled due to increasing interest rates, home prices and a shortage of inventory. The Wall Street Journal indicated non-prime loans could bring renewed risks to the housing market as an increasing number of traditional mortgage lenders look to non-QM loans to shore up profits in a tough mortgage market. Joining the podcast to discuss distressed real estate and mortgage assets is Robert Napolitano, Principal and Fund Manager at Global Realty Investor Trust. Global Realty Investor Trust’s investment strategy is designed to capitalize on a variety of distressed real estate related assets nationwide. IMN NPL Mortgage Notes Forum is being held on February 7th and 8th in Fort Lauderdale. Listeners of the podcast can use code SP20 when registering for a 20% discount According to the latest data report from the S&P/Experian Consumer Credit Default Indices, First mortgage default rate rose from November to December in 2018. In addition to raising default rates, the housing sector is pressured by rising prices and higher mortgage rates. Sales of both new and existing homes are weakening. Joining the podcast to discuss the changing economic environment and to provide color on the NPL market is Cody Faller, President of Faller Financial. Cody has worked with many of the most sophisticated real estate and note operators in the country. Since 2011, Cody has personally facilitated and/or purchased over $150 million in residential notes across roughly two hundred transactions under the Faller Financial brand. Welcome to Capital Markets Today, and the IMN NPL Mortgage Notes Forum podcast. The forum is being held on February 7th and 8th in Fort Lauderdale, listeners of the podcast can use code SP20 when registering for a 20% discount According to many experts, housing could be heading for its worst year since the last housing crash as predictions of home sales continue on a downward trend for the next 12-plus months. In addition, talks of a possible recession looms as equity markets remain unstable. NPL/RPL investors are gearing up for a brisk year of trading as uncertainty about the economy and housing remain in the headlines. Joining the podcast today to discuss buying and managing NPLs is Nathan Turner, known as the Canadian Note Guy. Nathan started his business in Canada but shifted to the U.S. and has grown his portfolio substantially over the past few years.